Daimler, which is technically a “dormant” brand as of 2008, was founded in Coventry in 1896 by Frederick Simms. He acquired the rights to build Gottlieb Daimler’s cars in the U.K. Eventually they’d move away from the German designs and by the time the end came, their cars were just badge-engineered Jaguars. This car is powered by a 1.5-liter straight twin rated at four horsepower. Apparently, they were able to increase the power rating by two the following year. This car is a performer: it is described as a “reliable early finisher on the London-Brighton Run.” This is the sort of prototypical vehicle we imagine taking part in that event. Ownership history is known back to 1905 (which is pretty incredible) and the current owner has had the car for nearly 20 years. This car has never been restored, but just repaired and redone as needed. It’s remarkable. 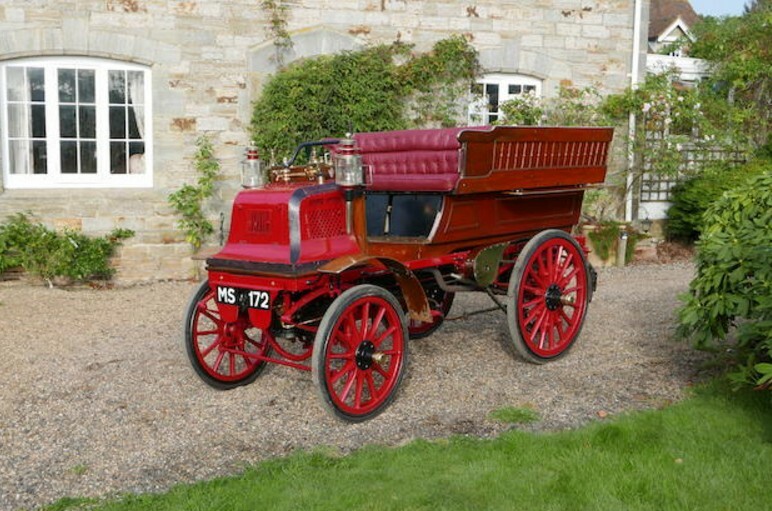 As one of the earliest known surviving British Daimlers, it should sell for between $240,000-$270,000. Click here for more info and here for more from this sale.